Access' 1989 VS Software Survey plays a familiar refrain. It's an old song, but with some new lyrics, that points out issues Wang Labs must face if it is to keep its installed base from singing the blues. IT'S BEEN A YEAR OF UNCERTAINTY for Wang Labs. This year has brought a changing of the guard for the Wang family, a new president, layoffs and a flood of red ink -- so much has happened, with many questions yet to be answered, it will be several months before the damage is assessed and the new course for the company becomes clear. After Wang reported its third Quarter losses, but prior to its disastrous fourth Quarter results and prior to Fred Wang's resignation as president and COO, Access conducted its fourth annual VS software survey, from July 1 to 31 (see "Rating Methodology," page 28). While these events probably wouldn't have influenced software scores, they might have had an effect on answers to questions in the "In Your Opinion" section, such as, "At your facility, do you plan to keep your Wang VS hardware?" The opinion section is used to take the temperature of the installed base, while the survey's main function is to gauge users' feelings on software products. 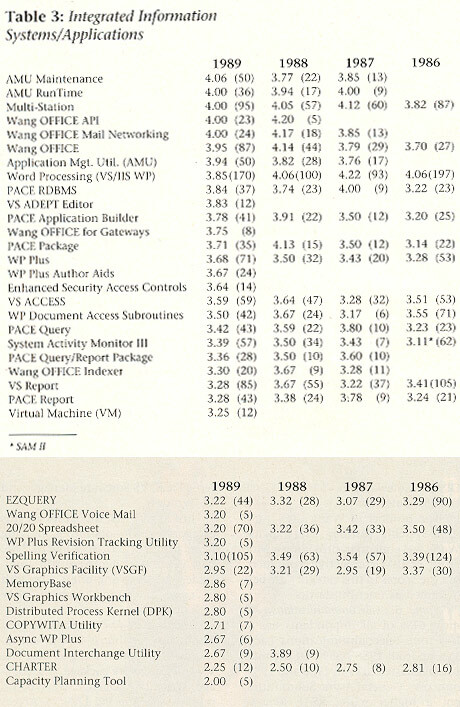 Summing up past surveys, in 1986 (see "The Good, the Bad and the So-So," September, page 40), users indicated a wide range in the quality of Wang software. Our 1987 survey (see "Software! Part One, VS Survey," November, page 44), reported an increase in scores for a majority of packages over their 1986 counterparts. The 1988 survey (see "Readers' Choice," December, page 32) showed software scores improving slightly. The 1989 (217 respondents) scores are, for the most part, down from 1988 (130 respondents). However, the one thing that hasn't changed much over the years are user comments. They seem to be repeated year after year it's the same old song. Survey says. Tables 1-7 (see pages 28-29) show the product rating averages for each package in 1989, and for 1988, 1987 and 1986 if the package was included in those surveys or if it was available at the time. Table 1: Programming languages. In 1989, 82% of all respondents use at least one programming language-up from 1988's 78%. All software packages had to receive five or more responses to be included. Every package ranked on 1988's survey received lower scores in 1989 except COBOL. For the third straight year, COBOL was rated at 3.92 -- an amazingly consistent average. The RPG II Conversion Aid dropped dramatically from 1988 to 1989. At 4.09, Procedure Language was the highest rated VS software package. COBOL also made the Top 10 highest rated packages, while the RPG II Conversion Aid is in the lowest 10. COBOL 85 entered the picture with a respectable 3.50 rating. Table 2: Wang Systems Networking (WSN). In 1989, 61% of all respondents use a WSN package, down slightly from 1988's 62%. The majority of respondents use File Transfer Manger, with a large group also using VS Terminal Emulation Service and VS NETCORE. 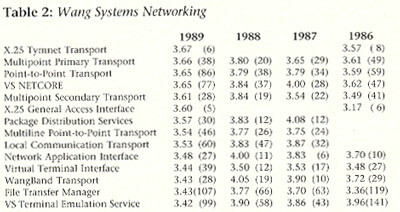 All 12 products ranked on 1988's survey scored lower in 1989, including three that dropped more than 10%: Network Application Interface (down 13%), VS Terminal Emulation Service (down 12.4%) and Wang- Band Transport (down 15.3%). Two packages received less than five responses: X.25 Telenet Transport and X.3 PAD. Table 3: Wang Integrated Information Systems/Applications. In 1989, 96% of all respondents use a Wang IIS/ Application package, up from 89% in 1988. Of the 26 packages that also appeared in 1988's survey, 5 scores increased while 21 were lower, including 4 whose scores dropped 10% or more: PACE Package (down 10.2%), Spelling Verification (down 11.2%), Document Interchange Utility (down 31.4%) and CHARTER (down 10%). The good news in this category is that the scores for Multi-Station and Wang OFFICE were among the Top 10 overall scores for the fourth consecutive year, and that 7 of the 10 highest rated packages (AMU, AMU Maintenance, Wang OFFICE Mail Networking, AMU Runtime, MultiStation, Wang OFFICE API and Wang OFFICE) are from this category. The bad news is that CHARTER made the bottom 10 for the fourth consecutive year and 8 of the 10 lowest-rated packages (MemoryBase, VS Graphics Workbench, Distributed Process Kernel, COPYWITA Utility, Asynch WP Plus, Document Interchange Utility, CHARTER and Capacity Planning Tool) are from this category. Three packages received no responses -- EXPRESS, VS IN/ix, OS and WP Plus Scientific Equations, while two packages received less than five responses -- VS SHARK and XDMS. EXPRESS is an obsolete package and will not be included in future surveys. However, for VS IN/ix, this is discouraging since IN/ix is Wang's attempt at a co-resident UNIX operating system. Because of the hoopla surrounding its release, we note that XDMS, Wang's new data management system, didn't receive enough responses for inclusion. Noteworthy are the scores for CHARTER and 20/20, which have decreased every year. Imaging. This is the second year imaging software has been included in the survey. Once again, not enough responses to qualify for inclusion. Five respondents reported using imaging products; however, no package received a total of five responses for inclusion. Unlike local area networking products, imaging has not yet entered the mainstream VS world. Table 4: OIS-to-VS Conversions. The two packages that qualified for inclusion both fell into the average range. These packages received less than five responses: OIS BASIC on VS, Preconfigured Software OFFICE Starter and VS/OIS WISE. Table 5: Wang/IBM Connectivity. Almost 34% of our respondents reported using a package from this category, up from 28% in 1988. Of the nine packages listed in those years, five went up, with SNA Gateway one of the 10 highest rated software packages. Of the four scores that declined, TC 3270 Emulation dropped 15.1%. Only one product, PROFS Interface-Host, received no response. The 12 packages that received less than five responses are fairly sophisticated and esoteric IBM applications. They are: ACCESS LU6.2 API, DCA Translation Routines, IDS Host-to-Host Transport, IDS Host Store/Forward Delay, IDS Logon, IDS Transport Interface, PROFS Interface-VS, SNA DISOSS LU6.2, VS ACCESS/APPC, VS OFFICE DISOSS Gateway and VS Host OFFICE DISOSS Gateway. The number of Wang sites using IBM systems justifies the expense Wang has gone to in providing a wide range of IBM connectivity products, but the scores in this category are best described as unenthusiastic. Table 6: Telecommunications. Almost 61% of all respondents use at least one telecommunications package, up from 1988's 55%. Of the nine packages listed in both 1988 and 1989, only one, General Async Subroutines, got a higher score. RSAF Remote dropped 24.6% and VS Remote Maintenance dropped 28.5%, which also has the distinction of being one of the 10 lowest rated products. Five telecommunications packages received no responses (DMF WAN Manager, InterOFFIX, TCP Interconnect, VS UPPC Development Tools and VS Videotext Host), leading all other categories in the "no show" area. Five products received less than five responses: DMF 802.3 Manager, DMF WangBand Management Facility, InterOFFICE, VS Software Manager and VS Window. Just as in 1988, the scores for this category are disappointing, ranging from a high of 3.67 to a low of 2.86. Last year's comments are still applicable, "While Wang offers a breadth of communications products, they lack depth." Table 7: VS-to-PC Networks: New to our survey, almost 13% of our respondents reported using at least one VS- to-PC network package. One package, Wang LAN OFFICE, received no responses, while PC LAN/VS Access received less than the necessary five for inclusion. Although the category is new, the number of responses indicates a growing amount of activity; however, the scores (3.30 and 3.09) garner an average rating. The big three. Respondents were asked to comment on the three products we feel are most strategic to Wang's success: PACE, Wang OFFICE and WP Plus. Despite the low numbers of copies sold -- none of the three has penetrated 20% of the installed base -- these three products are performing nicely, thank you. PACE. According to a Wang spokesperson, 3,917 copies have been licensed, up from 1988's 2,800 and 1987's 1,500. Scores for all but one PACE product (PACE RDBMS) were lower than their 1988 counterparts, yet there are interesting trends. PACE users plan to spend big bucks. The average PACE respondent plans to spend $1,439,296 on hardware and $226,518 on software in 1989. This contrasts to the non-PACE totals of $87,878 for hardware and $4,386 on software. PACE users plan to keep their systems. A total of 97.77% of all PACE users plan to keep their Wang gear, compared to 89% of non-PACE users. PACE users are happier with Wang hardware and software. While the scores were close on the question "Is Wang meeting your VS hardware needs?" (78.6% of PACE respondents agreed, while 76.1% of non-PACE respondents agreed), there was a wider divergence in the software area. Of the PACE respondents, 74.3% felt Wang was meeting their software needs, while 60% of non-PACE users felt that way. PACE users are more likely to install WIIS and Freestyle. Of the PACE respondents, 17% said they plan to install WIIS imaging systems and 10% plan to install Freestyle. The scores for non-PACE users were 10% and 3.6%, respectively. "I find it an excellent tool for what we use it for. We have a nonprogramming shop." "Excellent product. The best I've ever used." "Generally horrendous. Software has many good features, but we have endless problems with PACE and our VS systems." "PACE has been a disaster for us. The application developed by Wang personnel has been a failure and the entire process has been extremely frustrating. We still do not have a PACE application that is usable and it was to have worked 13 months ago!" "Once across the learning curve, development productivity exceeded our expectations." "I've used OFFICE since it first came out. I've set it up on several systems and I love the product." "Too many features for the casual user. Basically a solid product. Needs administrative reporting features and security classes for each menu, not one for all menus." "Very easy to use. Lack of cut and paste, memo copying and PopUp calendar/calculator utilities reduce functionality. Could also develop better alarm/reminder features." "Seems to relate well to other Wang products. Adds a lot of overhead. Has helped tax our VS 65 to its max on memory." "Generally, the most reliable Wang product used. Performs well with few flaws." I like it a lot. We used PROFS for the same period and users preferred Wang OFFICE over PROFS -- the components are well organized and adding the AMU makes it a good product." "Response time unacceptable. Many features not used as a result. Looking at other vendors' LAN-based software as replacement." processing programs (most notably, WordPerfect 5.0) have permeated the Wang office environment. With most WP packages offering more features than Wang WP, users are becoming disenchanted. WP Plus offers more features than Classic WP, but still lags behind many PC-based programs. In 1987, there were 1,471 copies of WP Plus in use, in 1988 the total climbed to 3,251 and in 1989 there are 5,802 copies. As in the past, users complain about WP Plus' performance. "It's great for the most part. It is, however, fairly easy to break it if you combine advanced functions." "Use it for only special projects. Too many keystrokes to memorize (although that may be the price to pay for the sophistication). Speed has increased drastically from early releases." "Above average minicomputer WP, but lacking in functionality compared to the high-end micro WP packages." "Employees who use WP Plus have very favorable things to say. I find it an easy-to-use program." "We have made WP Plus our standard editor. Features are excellent except for the spelling verifier, which often hangs 4230A workstations." "Slow, cumbersome, desperately needs WYSIWYG. Spelling too slow, needs better column functions. Will probably drop and use WordPerfect in future." "Very good. Inability to transfer documents in WSN a problem. Integrating PCs difficult due to poor documentation." New questions. This year, Access asked seven new questions to assess users' plans for the future. What are your purchasing plans (hardware and software) for 1989? The overall average for hardware spending was $340,124 and $53,320 for software. As noted, these averages are weighted heavily by the spending patterns of PACE users. At your facility, do you plan to keep your Wang VS hardware? Overall, 91% (187, yes; 18, no) plan to keep their Wang equipment. The most common reason, as one user succinctly responded, "It works!" Perhaps the second most common reason is the amount of money invested in hardware and software. Users have invested a great deal of time and money in Wang solutions and either they can't or see no reason to bail out. Generally, those who plan to move on are going to PC LANs or IBM systems. One respondent stated, "Corporate decision is to utilize large IBM CPUs and PC LANs. Wang machines couldn't keep up with our growth." Another reported, "This gear is history as quick as I can get it out of my shop. [Going to] DOS-based LANs." One of Wang's larger customers stated another reason for switching, "Lack of confidence in Wang's long-term commitment, marketing and system supports." Even those who plan to keep their Wang gear are looking at alternatives. As one large government agency stated, "Cost effective to keep; however, we plan to branch out into the IBM world. Possibly considering an IBM LAN. Luckily, Wang speaks with IBM now. It is very doubtful we will invest any more money in Wang hardware as IBM now seems to be the way of the world." Another respondent stated, "We're currently evaluating implementing PC LANs (nonWang) and downsizing the VS to run accounting only." Do you have any plans to install WIIS imaging products at your facility? Overall, 11.5% (23, yes; 177, no) have plans to install imaging products. According to our respondents, there are two main reasons for not buying a WIIS system: cost and need. Do you have plans to install Freestyle products at your facility? Only 5% (10, yes; 189, no) of our respondents have plans to purchase Freestyle products. Once again, cost was a primary consideration. Not only was the product not needed, it was "Too much like a toy" as one respondent in the legal marketplace remarked. Another said, "Does not fit our business needs. I see it as a manager's toy; something for the computer illiterate, something for a user who doesn't spend large amounts of time on the system." Although a government agency said it has the need, it isn't going to buy them because, "It wouldn't look good." Perhaps a shift in marketing might help. Is Wang meeting your VS hardware needs? Of those responding to this question, a disappointing 76.6% answered yes (151, yes; 46, no). Disappointing in that scores here should match the percentage of people planning to keep their systems (91%). What this score indicates to us is that 14.4% of the respondents plan to keep their system even though the vendor isn't providing what they want. The major areas of complaint are: price -- many users feel the system is too costly; support -- or lack thereof; the need for more users -- support for more workstations; and finally, the ability to hook third-party laser printers to the system without needing a black box. Printer and maintenance issues were a major concern of our respondents. "Yes. As long as we get good and prompt maintenance, we'll have no hardware complaints or changes." "No. Printer options expensive. Not cost effective. For a desktop laser with two trays -- $9,000; could get Panasonic equivalent for $3,500." "No. Reduce cost of maintenance. Provide more qualified personnel." "No. Not price competitive, behind in developing or interfacing to new technologies -- tape, optical, disk, workstations, monitors, etc." "Yes. I haven't had a CPU service call since October 1987. Most of our problems are 4230A workstation and 5573/74 printer problems. I'd like lower maintenance price. I could go third party and save money. Out of loyalty we haven't, but we're being heavily recruited." Is Wang meeting your software needs? Wang has some serious problems. "No. Write an OS with better I/ O control/speed." "No. Software upgrades need to be better tested before release. Problems need to be addressed faster. Initial release of software needs to be better tested on real configurations." "Yes. Need specialized legal software. PC litigation support. Need marketing support on PC software. Cost of other software high -- can get equivalent third-party much more reasonably." "Yes. I don't expect Wang to meet every software need, but I do think they should have made a fast backup that works." "No. The current OS is one of the biggest performance problems with the new 5000, 7000 and 10000 class machines. A new OS, built from the ground up, should be created to utilize the new machines." "Yes. We're a DP-only shop, don't use PACE, OFFICE or WP Plus. Most of the utilities we use work fine." If Wang manufactured a true UNIX minicomputer, would you purchase one? Just 8% ) (11, yes; 127, no) of our respondents would buy a UNIX minicomputer from Wang. The most telling response: "No. Wang, as a company, is too screwed up to buy anything that new from." Assessing the numbers. There are bright spots in this year's results, but the answers to the "In Your Opinion" section uncovered some disconcerting issues. When 9%0 (18 of 205 respondents) indicate they plan to drop Wang equipment, a chilling message is sent. With just under 77% percent of the respondents feeling Wang is meeting their VS hardware needs, an important deficiency is being noted. The 63% approval rating for meeting the customer's software needs is a serious issue to be addressed. It's software that drives hardware purchases and these scores indicate much more needs to be done or the percentage of users thinking of switching vendors will increase. "I've used Wang systems for 15 years. They were once a fine company with a good product. Now things have changed -- poor service, poor product testing and too expensive." "Wang is on the right track with WIIS, Freestyle and the VS 5000." Somewhere in between lies reality.